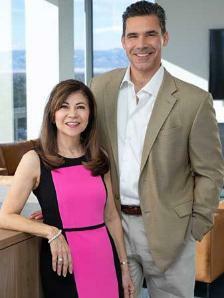 Thomas & Rosanne combine a unique set of backgrounds and skills to form a dynamic team capable of servicing a wide array of clients. Shortly after relocating to Colorado in 1997, Thomas began a 10-year career in the title and escrow industry. This culminated with a position as Sr. Vice President of National Operations for a nationally-licensed firm. The experience provided a fascinating perspective on the specific manner in which real estate transactions come to fruition across the country. In 2009 he joined Coldwell Banker to serve as Administrative Manager for one of the Front Range’s premier offices. His work was rewarded with receipt of the prestigious 2011 Denver Metro Association of Realtors Support Person of the Year. During this time, he also co-founded the Regis Networking Group, a networking organization designed to provide direction to adult learners from Regis University and the surrounding community. It has since developed into the Denver Leader’s Network. Rosanne’s eclectic experience has also served as a valuable foundation for success. Having worked in residential and commercial property management, she has vast industry experience. Further, she went on to work for The Integer Group, a global full-service advertising agency and Street Source Marketing & Communications. Since transitioning into real estate full-time, Rosanne has deftly utilized her marketing background and social media skills to promote our brand and has subsequently obtained her licensure to work closely with our clientele. These skill sets are the perfect complement to her contagious energy and ability to accurately identify the needs of new clients. As a dynamic partnership, they exemplify full-service care for their clients. Remarkable communication, ongoing market analysis, oversight of inspection and appraisal, and coordination of contractors are just a part of their concierge-level customer service. In their first full year (2016) as a selling team, Thomas and Rosanne recorded the 3rd highest sales volume for small teams at their previous Brokerage's Denver office. To make a positive impact in the community, Thomas and Rosanne are members of Wish for Wheels – a local non-profit that gives new bicycles and helmets to children in low-income communities. They contribute a portion of proceeds from every transaction Closed to this wonderful initiative. When not at work, find Thomas & Rosanne at the Denver Athletic Club where Thomas competes as an A-level racquetball player and Rosanne excels in Spin class. Both enjoy cycling outdoors on the fantastic bike routes north of Denver. If you see them on the road, be sure to say Hi!